ABL Medical announced the launch of SilvrSTAT Antibacterial Wound Dressing Gel for the management of 1st and 2nd-degree burns, stasis ulcers, pressure ulcers, diabetic ulcers, lacerations, abrasions, skin tears, surgical incision sites, device insertion site wounds, and graft and donor sites. SilvrSTAT is a 32ppm multivalent catalytic molecular nano-particulate silver that utilizes the company’s patented nano-molecular silver technology providing quick and continuous antibacterial activity. The transparent gel has no sulfa component or alcohol, and SilvrSTAT is non-flammable. It has been shown to inhibit the growth of Staphylococcus aureus, Pseudomonas aeruginosa, Escherichia coli, MRSA, VRE, and Candida albicans. 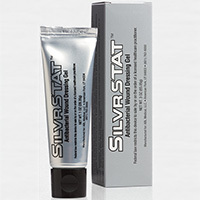 SilvrSTAT Antibacterial Wound Dressing Gel is available in 1oz or 3oz tubes. For more information call (810) 763-8000 or visit www.silvrstat.com.